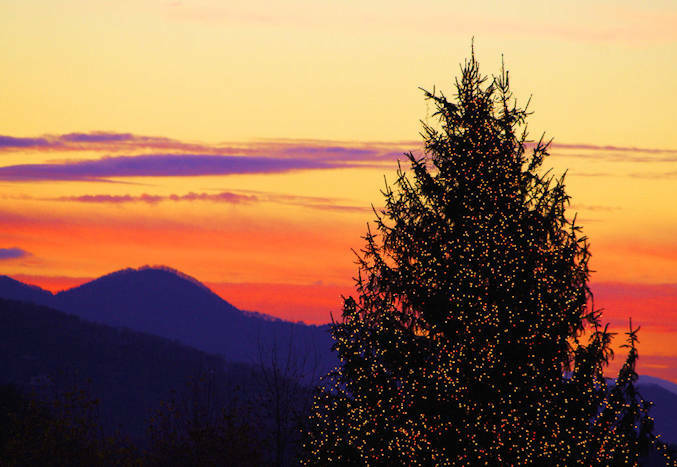 Are you visiting the Asheville area on Christmas Day or week? There are so many things to do. Celebrate with your family or friends and make memories for many years to come. As with most cities, most businesses close on Christmas Day - but we do have a list of restaurants open below. Yes, Biltmore House is open for daytime tours on both Christmas Eve and Day (closes at 2 PM on the 25th), but no candlelight evening tours on those days. Buy your tickets well in advance (save $10 if at least 7 days ahead) since they will have many sold-out days this week. See our Christmas at Biltmore Guide. Enjoy free parking in downtown for three days at Christmas (Dec 23, 24, 25). Most shops and galleries are open the day before and after Christmas. See our downtown Asheville Guide. The big light display in the gardens of the Arboretum will be open both Christmas Eve and Day, 6-10 PM. Cafe has a buffet both days. Buy tickets in advance (no tickets at gate) - they often sell out this week. 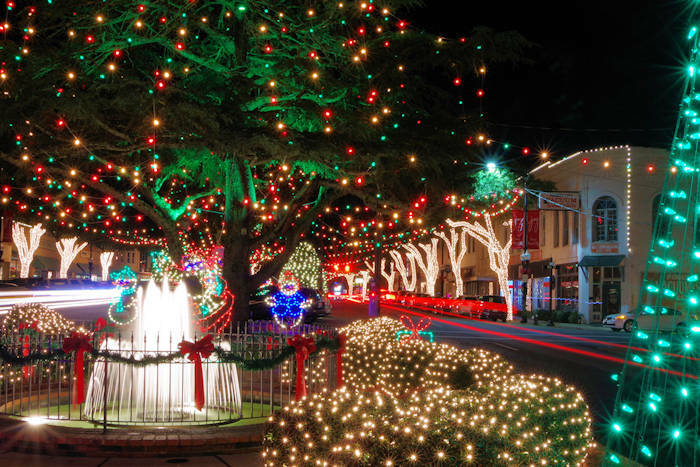 Go to our Winter Lights Guide for more. Looking for snow? Typically, our only white Christmas locations are our ski slopes with manmade snow. See our Top Ski Resorts near Asheville. Since the weather will feel more like spring, many will head outdoors for a walk or hike. Most trails in the national forest and parks will be open - but visitor centers will be closed. State parks, including Mt. Mitchell, Lake James and Gorges, are closed on Christmas Day. 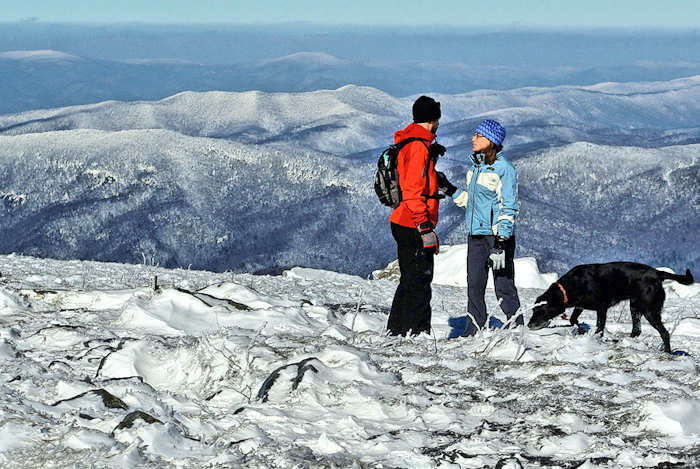 See our Top 20 Winter Hikes. Typically, higher sections of the Blue Ridge Parkway are closed for ice and snow. But if the weather is warm, it could be fully open. Omni Grove Park Inn Restaurants: Christmas Eve (12-8:30 PM) & Day (12-8 PM) legendary buffet in the Blue Ridge Dining Room, $59-$65/adult & $25/child 6-12. Plus the festive Christmas Day Buffet in the Grand Ballroom is 11 AM-6:45 PM, $65/adult & $25/child 6-12. Vue 1913 features a 3-course menu ($75/person) 2-9:30 PM on Christmas Day. Edison Craft Ales & Kitchen open on the 25th 11 AM-11 PM with a seasonal menu. Reservations are a must - well in advance. Biltmore Estate Restaurants: The big Christmas Eve and Day buffet at Deerpark is $54/person. 11 AM-5 PM both days. Call 828-225-6260 to reserve. Other restaurants, including Bistro and Stable Café, will be open regular hours. Bistro reservations: 828-225-6230. You'll need either an admission ticket or season pass to get inside the estate for the restaurants. Book well in advance! Grand Bohemian Hotel / Red Stag Grill contemporary European comfort food Christmas Day Four-Course Brunch in Ballroom, 11 AM-3 PM, $70/person. Christmas Eve 5-10 PM & Day 4-9 PM Four-Course Dinner 5-10 PM, $85/person. Biltmore Village. Strada Italiano: Christmas Eve regular menu plus Feast of the Seven Fishes, downtown, 11 AM-9 PM. The Blackbird: Limited menu on Christmas Eve, 5-10 PM, downtown. Bouchon: Open 5-9:30 PM on Christmas Eve, downtown. Season’s at Highland Lake Inn: Outstanding Christmas Day buffet featuring many choices. Flat Rock (near Hendersonville). 11 AM-5 PM. $52/adult, $26/child ages 6-11. Reservations required. Christmas Eve buffet 5-8 PM, $48/adult, $24/child. If you stay in a hotel or B&B, most will serve breakfast on Christmas morning. So that's a great way to start the big day! Find the perfect place to stay.